What is Record Retention Online and Why Do You Need It? Record Retention Online (RRO) is an annual subscription-based online database of record retention guidelines provided by Carolyn Jones, CEO of Financial Records Consultants. Subscriptions are not automatically renewed but are invoiced to the primary user’s email address 4-6 weeks before expiration. Our goal is to help you stay compliant with your regulators. To comply with regulators your institution must maintain a multitude of records. Failure to retain or destroy records according to regulations may lead to fines or worse. Our database allows you to search over 4100 records which have a retention requirement and the requirement is cited in the source column of the schedule. Other records which do not have a specific requirement under the law are listed as “opinion” or “best practice.” We advise our clients to follow the retention periods recommended for these records as they may have a different name but fall under a similar law. Implementing and following a safe and sound retention procedure will demonstrate to regulators that your institution is making its greatest effort to stay in compliance with every record it generates and manages from creation to destruction. Storage, maintenance, and destruction costs are high and rising higher every year. Knowing when your records can be destroyed will give you peace of mind, will save money in storage fees, and reduce the expenses you may incur when complying with legal requests. 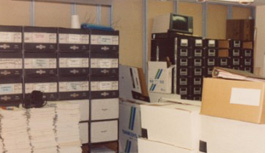 If you outsource your boxes, or keep them on premisis, we can help you “cut the fat” and get rid of the boxes that have no legal, fiscal, historical, or archival value, and have met the legal retention requirements of state and federal statutes and/or regulations. Historically speaking, this will eliminate approximately 66% of records that you have in storage, as well as saving you 66% of the money you are spending on your storage expenses. Review the money that you are spending on storage and take 66% of that off and I strongly feel this is what you will save! This is an estimate based on what I have experienced with clients. Wouldn’t it will be worth your time to see what can we do for you? With RRO, customers have the ability to view the latest guidelines on more than 4,100 separate banking records in the federal schedule. Full access to the online guide which includes the Federal Schedule and any optional state schedules you purchase. Full access to the Policies and Procedures section with step-by-step instructions and forms (including destruction forms) which will help keep your institution's retention program compliant, documented, and efficient. Also included are specific references to many statutes and regulations specifying the required record retention period. Full access to a subscriber-only "Ask the Author" page. Subscribers are also welcome to contact Ms. Jones with questions. We pride ourselves on personal service. All financial institutions need to purchase the Federal Schedule. Institutions regulated by the state should purchase both the Federal and State Schedules (see availability map). These two individual schedules are integrated into a master retention schedule for your financial institution. Multi-Bank Holding Companies must purchase a separate subscription for each of their member banks regardless of their Charter. If you have a Mortgage Company/Securities Company as part of your institution, you will need a separate federal subscription for each. Each state schedule contains records specific to their state and the total number of records listed varies depending on the available information. 1. You can sign up right now by clicking on the “Subscribe Now” link. We accept Visa and MasterCard only and all transactions are secured by VeriSign. When you time for renewal is approaching we will notify you by email but rest assured we do not keep your credit card information and we do not automatically renew. Refunds may or may not be given depending upon the length of the subscription and usage. We reserve the right to make the refund available on a case-by-case basis. Please note that on orders over $1,000.00 we would prefer you mail in your payment or pay by ACH; you will still be able to have access to the system immediately by notifying us that you would like to order. 2. If you would rather pay by check, click on the link for an order form. It's that easy, so sign up today! Financial Institutions with more than 50 branches may still have same day activation by clicking here. or by calling us at 615-445-2354 to place your order.